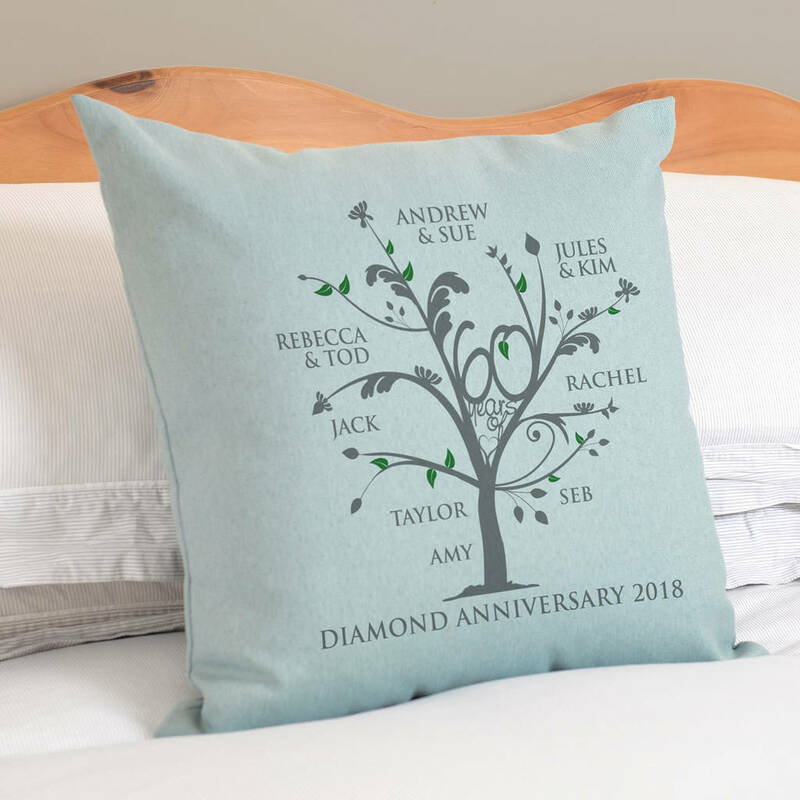 A stylish personalised family tree cushion, with your own family members' names - the perfect gift to celebrate 60 wonderful years together! 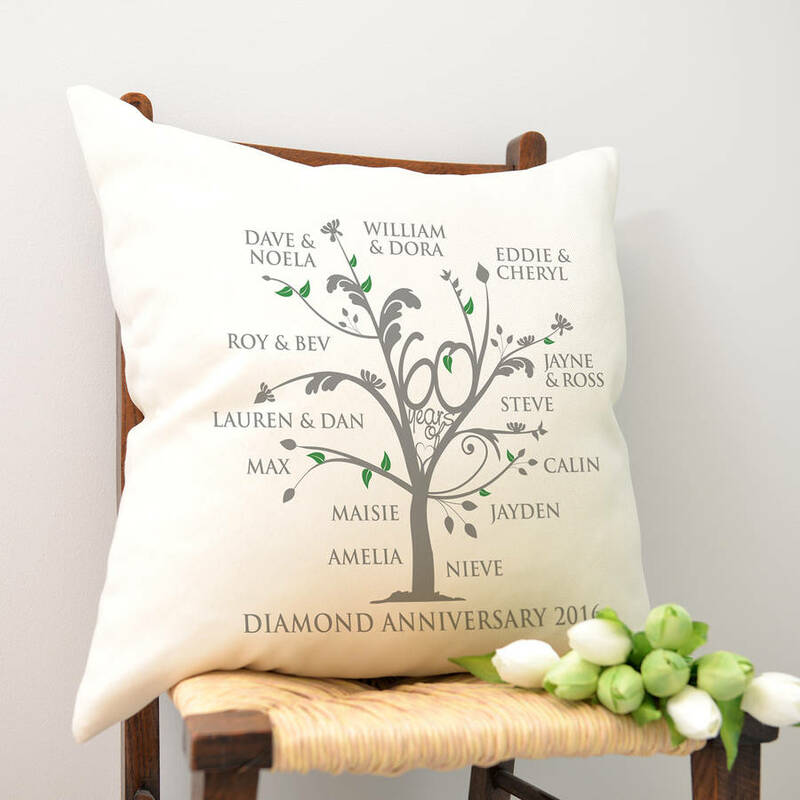 This cushion is 100% unique to the recipients to mark their Diamond Wedding Anniversary. Add their names to the tree, along with their children and grandchildren. You can even include the family pet! In the branches is "60 years of (love)". 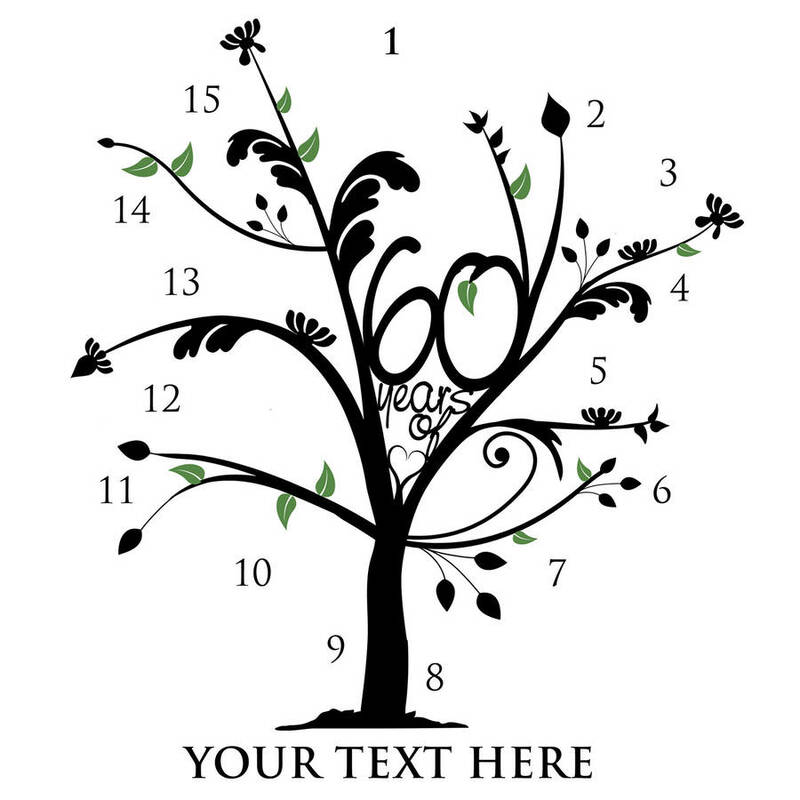 There are 15 places on the tree you can personalise. Each spot can contain either a single name (eg; Claire) or 2 names for a couple (eg; John & Sue). 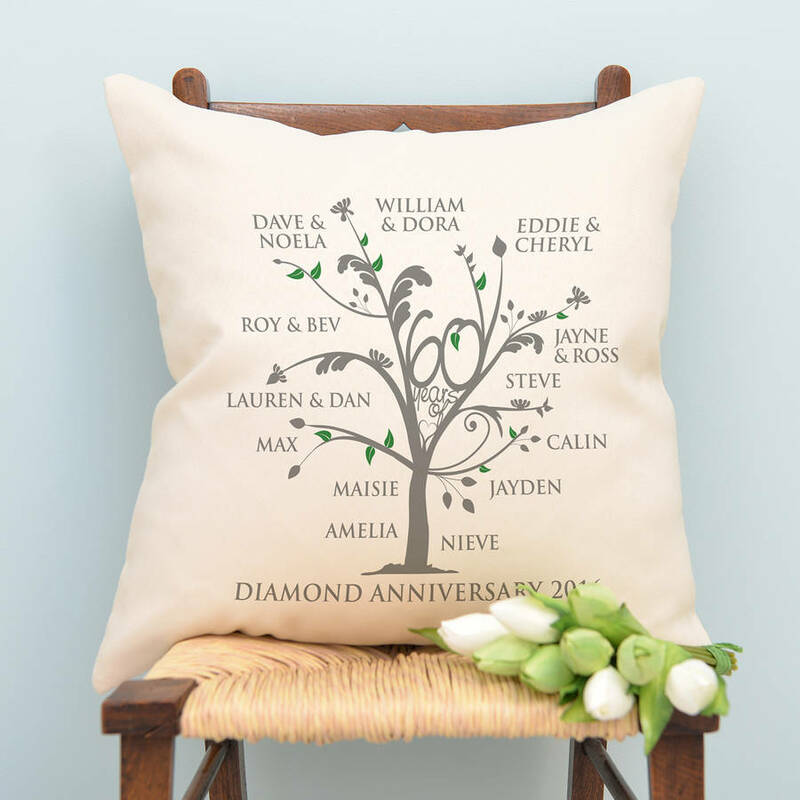 You can choose to have the diamond couple's names at the top in postion 1 (following a traditional family tree format) or you can add their names at the bottom (the oldest forming the "roots" of the tree). You are welcome to add a line of text along the bottom eg. 'The Taylor Family' or 'Diamond Wedding Anniversary 2016'. Please type your names in positions 1-15 in the boxes that correspond to the image of the tree with the numbers 1-15 (picture 2), so we know where to place your names in relation to the correct side of the family. If you would like couple's names together on one branch, please type eg; 'Ann & John' into one box in the correct position. If you do not have 15 names, you can leave positions blank and we will place your names wherever you enter them. For example, if you would only like 6 positions filled on the tree, we would recommend positions 1, 4, 7, 11, 13 and 15 so the 6 names are spread around the tree nicely. We recommend starting with the eldest (the diamond couple) at the top, but you are welcome to change the order to start with the diamond couple at the bottom by typing their names into boxes 8 or 9. If you would like to include pets' names please type (pet) next to their name so we can make them a little smaller in relation to the other family names, eg: WHISKERS (pet). 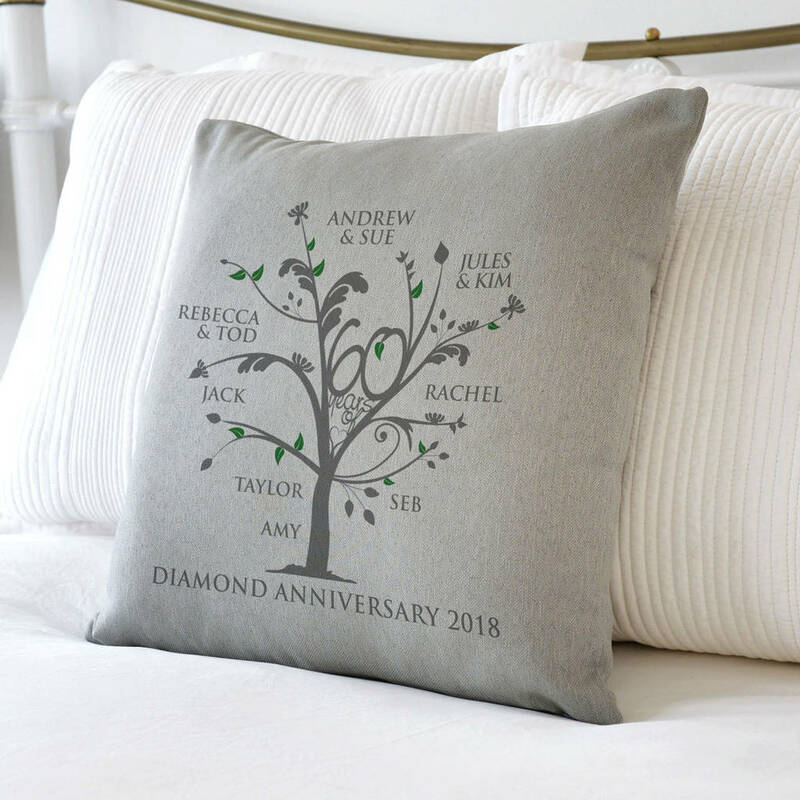 The cushion comes in neutral with grey text and a green and grey tree. This high quality cushion is made from polyester and is very soft to the touch. The text is printed onto one side only. Supplied with or without a luxury cushion inner - super soft non-allergenic pure hollow fibre. The cushion cover has a zip so the inner can be added or removed, and is machine washable. Please refer to the care instruction label within the cushion cover (please wash with similar colours). 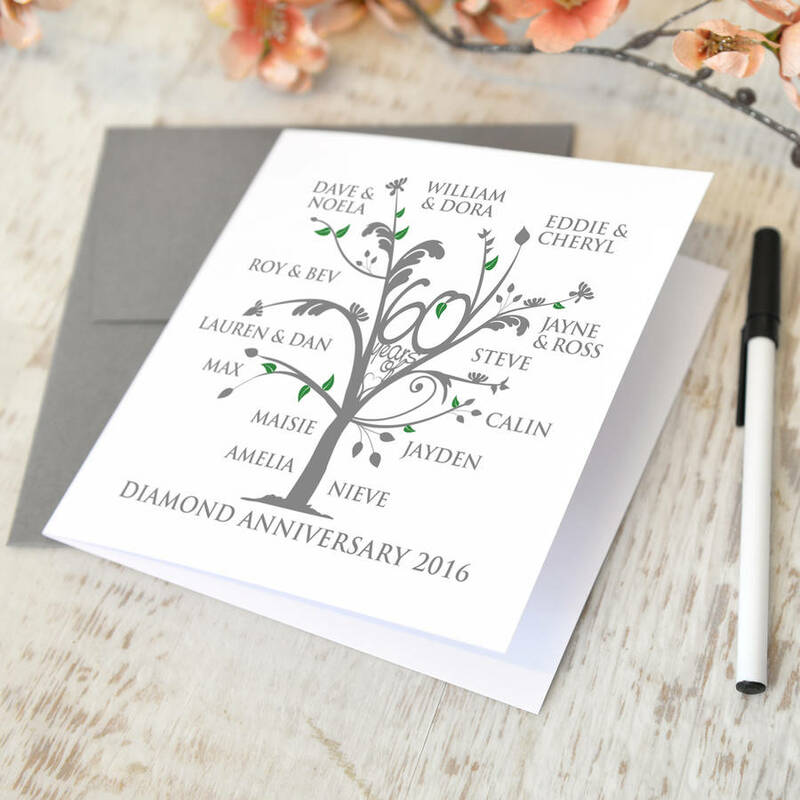 If you would like a matching greetings card of your anniversary tree design please select this in the dropdown menu. This will be enclosed with the cushion so if you are sending it as a gift the recipient will know who it is from. The cushion comes in cream or grey or duck egg blue with grey text and a green and grey tree. Cushion size: 50 x 50cm. If your text contains letters with accents or text that is not English please ensure that you type the text exactly as you would like it to appear, we will use your text EXACTLY as you have provided it. If in doubt select the option to ‘see a proof’ as this will allow you to check that your names or words are exactly as you wish them to appear and changes can be made to correct any errors.